The Peugeot 202 launches in 1938. 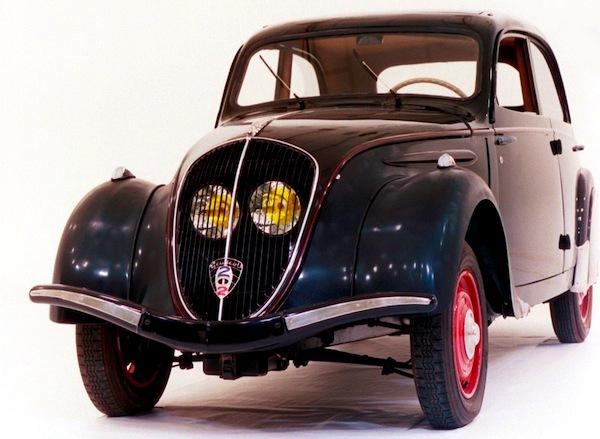 After spending much of the thirties in muddied waters, the French new car market displays a very healthy 11% growth in 1938, passing the 200,000 sales milestone for the first time since 1930 at 205,677 units. This includes 181,637 new private cars (+11%), 22,551 trucks (+7%) and 1,489 buses (n/a). Little did everyone know that 1938 would also be the last year with more than 200,000 new vehicles finding a buyer in France until… 1951. There is one worrying sign at the horizon though: exports are down a harsh 13% on 1937 to just 23,785, while imports are also down 14% to 2,294 units. All-in-all, only 4,720 foreign vehicles were sold in France in 1938, a meagre 2.3% market share. As usual, Citroen, Renault and Peugeot should dominate the brands ranking with the successful Peugeot 202 launching this year. France 6 months 2014 – Private Sales: Dacia Sandero 800 units off pole position!